Toss all ingredients except Pepitas into a large soup pot or Dutch oven and heat to a boil. Then cover and reduce heat to a simmer. Let simmer for 20 to 30 minutes or until all the vegetables are extremely tender. 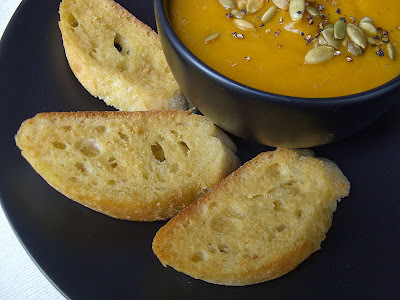 Now if you have an immersion blender, you can use it to puree your soup but if you are using an enameled Dutch oven you may not want to do that because the immersion blenders can chip your Dutch oven coating. Instead, you can puree your soup in batches in a regular blender. This recipe makes 4 large bowls of soup... but don't be afraid and prepare for glory! No surrender! That is Vegan Law! No vegan soup shall be spared! Don't forget the Vegan Parmesan Croutons... We made ours large to be dipped in the soup but I also like them with Caesar salads. Brush each slice of Bread with Olive Oil and then sprinkle 1 tablespoon of Vegan Parmesan Cheese over the top evenly. Place them on your loyal pizza stone and put them into the oven. Pull them out when they are a light golden brown. It shouldn't take more than 10 minutes. This is the Vegan Parmesan Cheese we used. * This is probably only funny if you remember the movie based on Frank Miller's graphic novel 300. I admit I was misquoting 300 a little too much yesterday while I was cooking. That looks so good! I caught the 300 reference and said it all in the voice (in my head. I'm actually no good at impressions). Love the hot-sweet combo. Perfect for autumn. Holy moly this is good! As someone who's not wild about butternut squash OR sweet potatoes, I have to say I was skeptical. I happened to have 100% of the ingredients thanks to my CSA box & I love my creole seasoning, so what the hell! This is now one of my all time favorite soups. Ridiculously easy, low fat, not too sweet & crazy tasty. 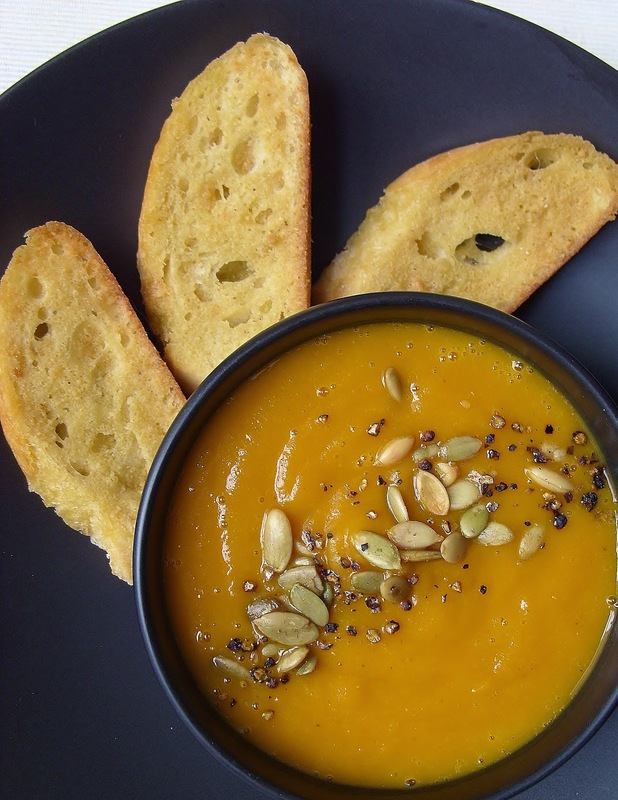 This is officially my default butternut squash recipe. Thank you!